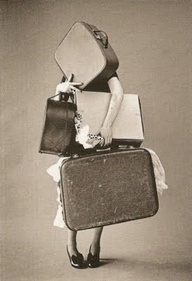 Even though I know that carrying around a lot of baggage is heavy and quite frankly extremely overwhelming I still do. And yet, I still question myself as to why that is? I think that I have finally come to the conclusion. We all carry something with us. While, it would be easier to drop what we have we don’t. The reason is because of fear that there may be a chance we might let go too soon. After all, isn’t that everyones biggest fear? If you have something and then you loose it….. you want to hold on so tightly in hopes that it may return. Whenever, you think that you may want to let go of this “extra” baggage you stop and think about the small chance that the second you give up your chance will come and it will be too late. Honestly, it’s ok to want to hold onto the past especially, if it is something great. The one thing that from now on I am going to remember is if I am going to hold onto the past it must be something worth my while. When you carry something with you it takes a part of you. As long as you are ok letting something consume you then, it is worth it to keep holding on. However, really put some thought into it and don’t carry around the petty things. Only important things should be carried onward. I for one am going to keep that in mind when worrying about things in my past.